The sound of snoring is irritating and annoying and can lead to sleep deprivation for your partner. Research has consistently found that exposure to noise above 40dB can have a negative effect on all areas of our wellbeing. When snoring becomes a persistent problem, Rosewood Dental Clinic's anti-snoring devices can help. You may also suffer from Temporomandbular Joint Disorder (TMD) - a problem affecting the ‘chewing’ muscles and joints between the lower jaw and the base of the skull. Jaw pain, clenching and grinding of teeth are common problems. Teeth can be damaged and a number of different painful symptoms associated with the jaw can affect your overall quality of life. If you snore, it may be that this nocturnal habit is causing damage to your oral health. That deafening, grunting sound that we make when sleeping is caused by the muscles in the roof of your mouth, tongue and throat relaxing enough to partially obstruct the airway. It is these soft tissues that vibrate when the air flows past, generating the disrupting snoring noise. Saliva washes dead skin cells off your tongue, cheeks and gums. If not washed off, these cells breakdown and begin to smell. Without saliva, harmful bacteria from food & drink can grow too quickly. Continuing with a good oral health routine will help to combat some of these effects. Additionally, it is something that you can explore with your dentist, who will be able to adjust the bite of your teeth or recommend an appliance to ease your snoring. Cerezen is a pioneering medical innovation that effectively treats jaw pain, facial pain and tension headaches. Discreet and almost invisible, these customised devices can be worn day or night. They’re comfortable because they’re specially-made for you. The two custom-made, 3D printed hollow inserts sit comfortably in each ear canal; the nearest access point to the temporomandibular joint. The Somnowell Chrome is designed to gently hold the lower jaw and tongue in the 'recovery position' whilst you sleep and thereby keeping your airway open. This simple and effective treatment option has become the world's most popular solution for snoring. There are a number of solutions for both snoring and sleep apnoea. Mandibular Advancement Splints (MAS) are commonly used for both, gently holding the lower jaw forward to keep the airway open. For severe sleep apnoea (typically tested in a sleep clinic, but can also be done in your own home), Continuous Positive Airway Pressure (CPAP) is recommended and offers the highest clinical success. Compliancy, however, can prove to be an issue. For those that cannot get on with CPAP and for moderate sufferers, (less than 30 interruptions an hour), a splint is the most common treatment of choice - highly effective, less expensive and more patient friendly. Customised for each patient, there are a number of splints of the market. 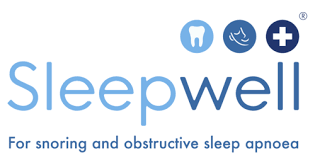 Now made in the UK (Sheffield) using a unique manufacturing process, Sleepwell has been shown to be the most clinically successful.